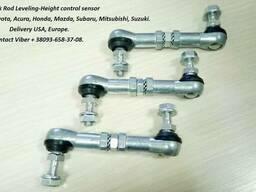 We offer Link Height control sensor, HeadLamp Level sensor Link. 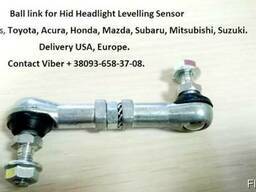 The headlights of your car are very low or blinding oncoming drivers (air suspension becomes in emergency mode) and diagnosed that the traction of the body position, the headlight leveling is acidic or broken and the cost of the new assembly with a sensor from $ 150, do not worry you can buy traction without a sensor. 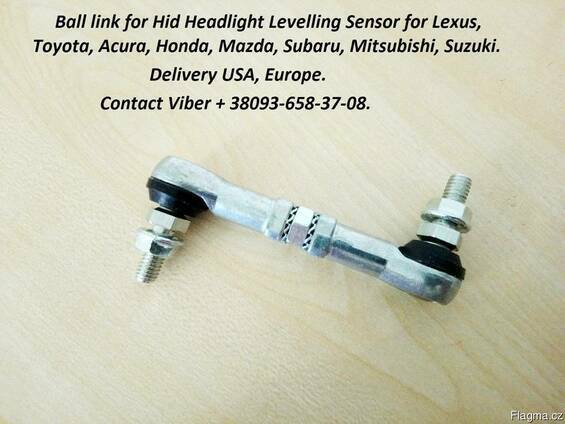 Universal link front rear hid headlight level sensor available for Toyota, Lexus, Honda, Acura, Mitsubishi, Mazda, Subaru, Suzuki. Price $ 20. Delivery USA, Europe from $ 10. 8940630140, 8940760022, 8940860040, 8940741010, 8940560020, 8940648020, 8940660012, 8940760021, 8940830130, 8940548010, 8940550070, 8940650100, 8940650100, 894080E010, 894070E010, 8940550090, 8940550100, 8940560010, 8940650120, 8940712030, 8940734020, 8940760040, 8940830150, 8940848020, 8940860011, 8940548020, 8940648010, 8940750070, 8940860030, 8940650130, 8940660010, 8940748060, 8940760031, 8940653010, 8940660030, 8940720020, 8940760010, 8940830110, 8940850070, 8940706010, 8940848030, 8940624050, 8940860020, 8940748010, 8940776010, 8940834010, 8940834030, 4890760031, 33136TL0G01, 4890635010, 894070G010, 8651A064, 8651A065, 8651A105, 8651A106, 8651A045, 8651A095, 8651A047, FE035121YD, 8940760022, 8940760010, 8940748030, 8940860011, 8940648020, 8940560012, 89405-48020, 8940760021, 8940550070, C2735122Y, 8940660010, 8940848020, 8940720020, 06146SWAR01, 06136SWAR01, KD545122Y, GS1F5122YB, 33136T1GG01, GS1F5121Y, BP4K5122YA, GS1F5122YC, E2215122YA, 8940834010, 33146TA0J01, 33146SWA003, 33146SMGE01, 33136SMGE11, 33146TM8J01, 33136STXA01, 33136SZTJ01, 33146SEAG01, 33136TK8A01, 33186STXA01, 33146STXA01, 33136SWA003, 33196STXA01, 8282112430, 33136SEAG01, 84021AG000, 84031FG000, 84021AG000, 84031AG000, 84021XA000, 84031XA000, 84031FE000, 4890635020, 4890535020, 4890660010.